For the purpose of this guide the term "product" covers equipment, protective systems, safety devices, components and their combinations. It has to be stressed that Directive 94/9/EC carries obligations for the person who places products on the market and/or puts products into service, be it the manufacturer, his authorized representative, the importer or any other responsible person. The Directive does not regulate the use of equipment in a potentially explosive atmosphere which is covered, for instance, by Directives 1999/92/EC, 92/91/EC and 92/104/EC11. This means the first making available in the European Union, against payment or free of charge, of products, for the purpose of distribution and/or use in the EU territory. d) new or "as-new" products labelled by a person who is not the original manufacturer. The Directive's provisions and obligations concerning placing on the market have applied after 30 June 2003 to each product individually and are irrespective of the date and place of manufacturing. It is the manufacturer's responsibility to ensure that each and all of his products comply where these fall under the scope of the Directive. "Making available" means the transfer of the product, that is, either the transfer of ownership, or the physical hand-over of the product by the manufacturer, his authorised representative in the EU or the importer to the person responsible for distributing these onto the EU market or the passing of the product to the final consumer, intermediate supplier or user in a commercial transaction, for payment or free of charge, regardless of the legal instrument upon which the transfer is based (sale, loan, hire, leasing, gift, or any other type of commercial legal instrument). The ATEX product must comply with the Directive at the moment of transfer. If a manufacturer, his authorised representative in the EU or the importer offers products covered by the Directive in a catalogue, they are deemed not to have been placed on the market until they are actually been made available for the first time. Therefore products offered in a catalogue do not have to be in full conformity with the provisions of the Directive 94/9/EC, but this fact should be clearly advertised in the catalogue. 10 For general definitions see also the "Guide to the implementation Directives based on New Approach and Global Approach" ("Blue Guide" – see footnote 6). Further definitions specific to Directive 94/9/EC are covered in chapter 4 of this Guide. the display of products at trade fairs and exhibitions12. These may not be in full conformity with the provisions of the Directive 94/9/EC, but this fact must be clearly advertised next to the products being exhibited. The person placing the product on the EU market, be it the manufacturer, his authorised representative or, if neither of them is established in the EU, the importer or any other responsible person, must retain at the disposal of the competent authority the EC declaration of conformity. The technical documentation has to be made available on request of the enforcement authorities within a reasonable time (see Annexes III, VI, VIII to the Directive). These documents shall be maintained by such a person at the disposal of the competent authorities for ten years after the last item has been manufactured. This applies to products manufactured in the EU as well as those imported from a non-EU country. This means the first use of products referred to in Directive 94/9/EC in the EU territory, by its end user. Products covered by Directive 94/9/EC are put into service at the moment of first use. However, a product which is ready for use as soon as it is placed on the market and which does not have to be assembled or installed, and where the distribution conditions (storage, transport, etc.) makes no difference to the performance or safety characteristics of the product with reference to the EHSRs of Directive 94/9/EC, is considered to have been put into service as soon as it is placed on the market, if it is impossible to determine when it is first used. This is any natural or legal person who manufactures a product or has a product designed or manufactured, responsible for the design and construction of products covered by ATEX Directive 94/9/EC, and markets that product with a view to placing it on the EU market under his own name or trademark. The manufacturer may design and manufacture the product itself, or alternatively may use bought­in items, third-party subcontractor services or components, CE marked or not, to assist in the manufacture of the product. Whoever substantially modifies a product resulting in an "as-new" product13, such that its health and safety characteristics (and/or performance) are in any way affected, with a view to placing it on the EU market, also becomes the manufacturer. 13 See chapter 7 of this Guide. The manufacturer may have the product designed, manufactured, assembled, packaged, processed or labelled by subcontractors, with a view to placing the product on the market under its own name, and thus presenting itself as the manufacturer, disregarding its involvement in the physical/actual manufacturing processes. Where subcontracting of this type takes place, the manufacturer must retain the overall control for the product and ensure that it receives all the information that is necessary to fulfil the responsibilities of a manufacturer according to the Directive. In such cases, it cannot discharge itself from its responsibilities as a manufacturer, as it is responsible for the application of relevant conformity assessment procedures, including engaging a Notified Body where required to do so by the Directive, for example to approve and carry out periodic surveillance of the manufacturer's quality management system. Due to the use of subcontractors, the manufacturer may not be able to demonstrate (to a Notified Body) that its own quality assurance system ensures the product complies with the requirements of the Directive. The production quality assurance (Annex IV) or the product quality assurance (Annex VII) system at the actual manufacturing plant premises, of the manufacturer itself and/or of subcontractors, need to be the subject of an assessment by a Notified Body, including periodic audit visits. The manufacturer may not rely on the Notified Body audits of the third-parties to discharge its responsibilities under the Directive. The Notified Body shall not issue the subcontractor with a QA Notification for this purpose, unless the subcontractor holds its own EC Type Examination certificate for the same product. a copy of the contractual agreement between A and B. See also the Consideration Paper by the ATEX Standing Committee "Certificates and CE marking without the name of the original manufacturer" (http://ec.europa.eu/enterprise/sectors/mechanical/documents/guidance/atex/standing­committee/ce-marking). -providing marking and instructions for safe use, maintenance etc. as described in Annex II to the Directive. The manufacturer has sole and ultimate responsibility for the conformity of his product to the applicable directives. He must understand both the design and construction of the product to be able to declare such conformity in respect of all applicable provisions and requirements of the relevant directives. Articles 8 and 10 and their associated annexes of the Directive 94/9/EC define the obligations incumbent on the manufacturer with regard to conformity assessment, CE marking, the EC declaration of conformity, written attestation of conformity (if relevant) and the arrangements for holding the EC declaration of conformity, together with the technical documentation, at the disposal of the competent authorities for a period of ten years after the last product has been manufactured. Whoever puts into service products covered by the Directive, which he has manufactured for his own use, is considered to be a manufacturer. He is obliged to conform to the Directive in relation to putting into service. This is the person or persons expressly appointed by the manufacturer by a written mandate to act on his behalf in respect of certain manufacturer's obligations within the EU. The extent to which the authorised representative may enter into commitments binding on the manufacturer is restricted by the relevant Articles of the Directive and determined by the mandate conferred on him by the latter. As an example, he could be appointed to undertake the testing in the EU territory, sign the EC Declaration of Conformity, affix the CE marking and hold the EC Declaration of Conformity and the technical documentation within the EU at the disposal of the competent authorities. The quality assessment system of the authorised representative/responsible person shall not be subject to assessment by a Notified Body, but the quality assessment system of the actual manufacturer. It would not be reasonable to assess a quality assessment system of a facility that is not producing the product. However, if the authorised representative is carrying out tests and/or verifications required by the Directive to determine conformity with the Essential Health and Safety Requirements, he shall be subject to quality assurance assessment. Articles 8 and 10 together with Annexes 3 - 9 to the Directive 94/9/EC define the obligations incumbent on the authorised representative established within the EU with regard to conformity assessment, CE markings, EC Declaration of Conformity and the arrangements for holding this EC Declaration of Conformity, together with the technical documentation, at the disposal of the competent authorities for a period of ten years after the last product has been manufactured. Where neither the manufacturer, nor the authorised representative is established within the EU, any other person resident in the EU who places the product on the EU market has obligations under the scope of the Directive. The only obligation is to keep available the necessary documentation at the disposal of the competent authorities for ten years after the last product has been manufactured. In their capacity as "person responsible for placing on the market" they are not entitled to assume other responsibilities which are solely reserved to the manufacturer or his authorized representative (e.g. signing the EC Declaration of Conformity). Equipment15, as defined in Directive 94/9/EC, means machines, apparatus, fixed or mobile devices, control components and instrumentation thereof and detection or prevention systems which, separately or jointly, are intended for the generation, transfer, storage, measurement, control and conversion of energy and/or the processing of material and which are capable of causing an explosion through their own potential sources of ignition16. Equipment is only considered to be within the scope of the Directive if it is intended (either in whole or in part) to be used in a potentially explosive atmosphere. If a product containing an intended potentially explosive atmosphere, for example a vessel, itself contains equipment as defined in the Directive, then the latter equipment is in effect in a potentially explosive atmosphere, albeit one which is contained by the vessel, and is therefore subject to the Directive. If equipment containing a potentially explosive atmosphere can, due to its construction, operation etc. create a potentially explosive atmosphere itself, which wholly or partially surrounds it, then such equipment is in effect in a potentially explosive atmosphere, and is therefore subject to the Directive. A third scenario is that there may not only be a surrounding potentially explosive atmosphere but also a process that requires such a mixture to enter and/or be released from the product. The interface between the equipment and the process input/ output will also require consideration. This may, in some cases, lead to equipment having more than one category, one (or more) for the external atmosphere and another for the process atmosphere. Another defining element of equipment in the sense of the Directive is that it has to have its own potential source of ignition. 14 It has become evident that a number of language versions of the ATEX Directives interpret some definitions in different ways. The information provided here is intended to inform interested parties throughout the EEA on the common approach agreed by the Member States. It does not, however, impact in any way on the different versions as implemented in relevant national legislation, nor the right of the manufacturer to choose this route should he/she so desire. 15 Article 1.3(a) of the Directive. 16 Following discussions in the Standing Committee and the standardisation bodies it should be noted that intrinsically safe electrical equipment is included in the scope of the Directive. Potential sources of ignition could be: electric sparks, arcs and flashes, electrostatic discharges, electromagnetic waves, ionising radiation, hot surfaces, flames and hot gases, mechanically generated sparks, optical radiation, chemical flame initiation17, compression. In some cases a product may only contain a potentially explosive atmosphere which is deliberately ignited. It is clearly not the intention that these fall under the scope of Directive 94/9/EC unless other relevant hazards exist. Most equipment made to the Gas Appliances Directive 90/396/EEC will fall into this category. Equipment can be said to have its own potential source of ignition, if, when operated as intended (including malfunctions, etc. to an extent depending on its category – see Annex I to the Directive) in a potentially explosive atmosphere, it is capable of igniting the latter unless specific safety measures are taken. Therefore, equipment must ensure the required level of protection. To ensure this required level of protection various techniques can be applied, e.g. : intrinsic safety, pressurisation, increased safety, etc. Many common items are made from plastics (polymers) with very low electrical conductivity. These can become charged, e.g. if they are rubbed, or if dust or a liquid flows over the surface. However, in most cases this may be controlled by the user, and if they are used in hazardous areas it shall be assessed and controlled according to the requirements of relevant national or community legislation (e.g. Directive 1999/92/EC18). In any case the user of such equipment has to consider these ignition sources when undertaking a risk assessment in the workplace. Examples are plastic containers used for transporting chemicals, polyethylene pipes, buckets and chairs. If the only source of electrostatic charging comes from the process, such items are not considered to have their own source of ignition, and they are not in scope of Directive 94/9/EC. In these cases they should not be Ex or CE marked according to Directive 94/9/EC. If the polymeric item is intended to be incorporated into ATEX equipment, and could become charged by the movement of the equipment (for example a fan blade) or by the intended use of the equipment, they may be classed as ordinary parts of the equipment with specific properties (e.g. to be electrostatically dissipative) or as ATEX components if they are placed on the market specifically for this intended use. If non-electrical equipment has a potential ignition source, in most cases this is due to moving parts able to create a potential ignition risk either from hot surfaces, or friction sparks. Examples are: gears, fans, pumps, compressors, mixers, brakes. Mechanical equipment of this type usually has to be connected to a power source, such as an electric motor. Together placed on the market in this form, it might be an assembly, see section 3.7.5. (e.g. pump) apply. If the electrical equipment fitted to the non-electrical equipment is not "simple apparatus", the product is usually considered as an assembly (see assemblies chapter). All potential ignition sources should be considered for equipment that is within the scope. For a list of potential ignition sources, see the relevant harmonised standards for equipment. In many cases the equipment will also be machinery within scope of Directive 2006/42/EC, see section 6. Many mechanical items move very slowly, or have very low power input. Such equipment may be incapable of forming hot surfaces or other ignition sources, even in cases of rare malfunction. The manufacturer should assess if such equipment is potentially capable of igniting an explosive atmosphere, and if it is not, it shall not be classed as ATEX equipment nor be marked according to Directive 94/9/EC (see also chapter 5.2.1). Electrical Equipment: equipment containing electrical elements, used for the generation, storage, measurement, distribution and conversion of electrical energy, for controlling the function of other equipment by electrical means or for processing materials by the direct application of electrical energy. It should be noted, that a final product assembled using both electrical and mechanical elements may not require assessment as electrical equipment provided the combination does not lead to additional ignition hazards for this assembly (for further details see section 3.7.5). From the term ‘jointly’ in the definition of equipment in the Directive it follows that an assembly, formed by combining two or more pieces of equipment, together with components if necessary, has to be considered as a product falling under the scope of Directive 94/9/EC (see footnote 1), provided that this assembly is placed on the market and/or put into service by a responsible person (who will then be the manufacturer of that assembly) as a single functional unit. Such assemblies may not be ready for use but require proper installation. The instructions (Annex II, 1.0.6.) shall take this into account in such a way that compliance with Directive 94/9/EC is ensured without any further conformity assessment provided the installer has correctly followed the instructions. In the case of an assembly consisting of different compliant pieces of equipment as defined by Directive 94/9/EC which were previously placed on the market by different manufacturers these items of equipment have to conform with the Directive, including being subject to proper conformity assessment, CE-marking, etc. The manufacturer of the assembly may presume conformity of these pieces of equipment and may restrict his own risk assessment of the assembly to those additional ignition and other relevant hazards (as defined in Annex II), which become relevant because of the final combination. If there are additional ignition hazards, a further conformity assessment of the assembly regarding these additional risks is necessary. Likewise, the assembler may presume the conformity of components which are accompanied by a written attestation of conformity issued by their manufacturer (Article 8.3, see also chapter 10). However, if the manufacturer of the assembly integrates parts without CE-marking into the assembly (because they are parts manufactured by himself or parts he has received from his supplier in view of further processing by himself) or components not accompanied by the above mentioned certificate, he shall not presume conformity of those parts and his conformity assessment of the assembly shall cover those parts as required. Note that the manufacturer's own risk assessment does not necessarily preclude the use of Notified Bodies in the applicable conformity assessment procedure(s). In order to clarify the concept of "assembly" in the sense of Directive 94/9/EC, a pump/electric motor combination intended for use in potentially explosive atmospheres can be used. 1. For the purposes of Directive 94/9/EC, a split tube motor pump constitutes a single item of equipment with respect to the ignition hazard, i.e. the pump and electric motor cannot be considered separately for the purposes of assessing explosion risk(s). In this case, the unit as a whole has to undergo the conformity assessment procedure of electrical equipment. The same applies e.g. for an electrical ventilating fan where the fan is an integral part of the motor. 2.a) In some cases the pump and electric motor can be considered separately although they form a functional unit. If in this case there is no additional ignition hazard as a result of assembling the pump and motor, this functional unit as a whole does not constitute a single item of equipment which falls within the scope of Directive 94/9/EC. It is then to be considered a combination of "individual items of equipment" in terms of explosion protection. In this case, therefore, the manufacturer of pump and electrical motor must supply an EC declaration of conformity for each of both items. 2.b) A manufacturer may nevertheless choose to supply pump and motor as described in 2.a) with one declaration of conformity for the assembly as a whole. In this case further clarification is required as to the obligation of the assembler where only ATEX CE compliant products (such as equipment and autonomous protective systems) are used. Here it is clear that the assembler needs to undertake an ignition risk assessment to ensure that the nature of the incorporation and assembly has not altered the explosion characteristics of the products with respect to the Essential Health and Safety Requirements. If the assembler is in any way uncertain as to how to undertake such an assessment, technical advice should be sought and taken into account! This might be the case, for example, if a manufacturer of mechanical equipment needs to connect different pieces of ATEX electrical equipment together as part of the assembly. Once the assembler has successfully undertaken such an assessment and no additional ignition risk has been identified, the general agreement is that he then draws up a technical file, affixes the CE and Ex marking according to Annex II 1.0.5 of the Directive to the assembly, indicating intended use, signs the EC Declaration of Conformity covering the whole of the assembly indicating the technical specifications/ standards applied (for example, for electrical inter-connection) and provide instructions for safe use. The assembler therefore takes complete responsibility for the assembly. This procedure does not require the involvement of a Notified Body. 2.c) If there is an additional ignition hazard as a result of assembling pump and motor, or if one item is not already in full conformity with the Directive, the assembly has to undergo the complete conformity assessment procedure appropriate for the category. In this case the manufacturer has already defined one or more invariable combination(s) of parts and places them on the market as a single functional unit / single functional units. An example could be instrumentation consisting of a sensor, a transmitter, a Zener barrier and a power supply if provided by one manufacturer. The above mentioned parts are put together by the same person (the manufacturer of the assembly), and placed on the market as a single functional unit. This person assumes responsibility for the compliance of the integral assembly with the Directive. The EC declaration of conformity, as well as the instructions for use must refer to the assembly as a whole. It must be clear (e.g. by enclosing a list of all parts and/or a list of the safety related data) which is/are the combination(s) that form(s) the assemblies. The manufacturer assumes responsibility for compliance with the Directive, and must therefore, in accordance with Annex II 1.0.6, provide clear instructions for assembly/installation/operation/maintenance etc. in the instructions for use. Here the manufacturer has defined a whole range of different parts, forming a "modular system". Either he or the user/installer selects and combines parts out of this range to form an assembly, which serves the specific task. An example could be a modular system for flameproof switch- and control gear, consisting of a range of flameproof enclosures of different size, a range of switches, terminals, circuit breakers etc. Although in this case the parts are not necessarily put together by the manufacturer of the assembly, and placed on the market as a single functional unit, the manufacturer is responsible for the compliance of the assembly as long as the parts are chosen from the defined range and selected and combined according to his instructions. The EC Declaration of Conformity, as well as the instructions for use must refer to the "modular system" as a whole. It must be clear which the parts that form the modular system are, and how they are to be selected to form a compliant assembly. Therefore the manufacturer must, in accordance with Annex II 1.0.6, provide clear instructions for selection of parts and their assembly /installation /operation /maintenance etc. in the instructions for use. The conformity assessment of such modular systems may be done (as a minimum) by means of the assessment of those intended configurations which are the most unfavourable regarding the relevant risks (worst cases). If those configurations are considered compliant to the EHSRs of Directive 94/9/EC the manufacturer may conclude conformity of all other intended configurations as well. If later on other parts are to be added to the "modular system" it may of course become necessary to identify and assess the worst case scenario again. 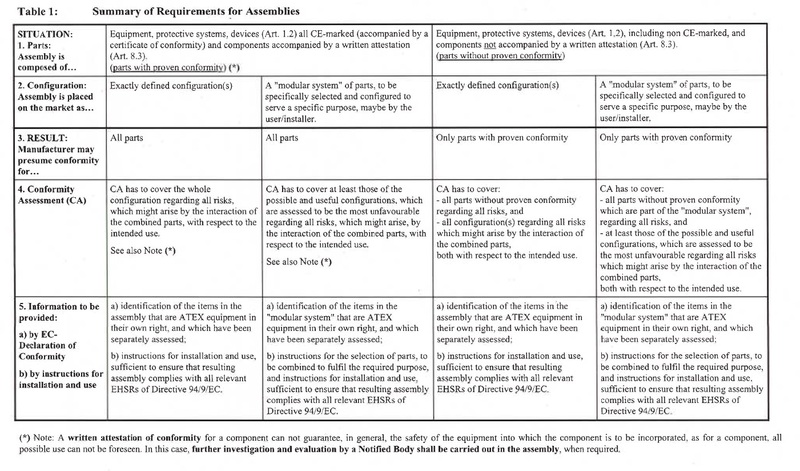 The table on the following page gives a condensed overview of the various situations regarding assemblies. (*) Note: A written attestation of conformity for a component can not guarantee, in general, the safety of the equipment into which the component is to be incorporated, as for a component, all possible use can not be foreseen. In this case, further investigation and evaluation by a Notified Body shall be carried out in the assembly, when required. Protective Systems19 means devices other than components of the equipment defined above which are intended to halt incipient explosions immediately and/or to limit the effective range of an explosion and which are separately placed on the market for use as autonomous systems. It is clear that certain simple products used in coal mines act as protective systems but cannot be subject to the provisions of the Directive (e.g. chalk dust on planks). From its intended function it is obvious that a protective system will, at least partially, be installed and used in a potentially explosive atmosphere. Because a protective system has the function to eliminate or reduce the dangerous effects of an explosion (a safety function) it is subject to the Directive regardless as to whether it has its own potential source of ignition or not. In this first case it would have to comply with the specific EHSRs for equipment as well. According to Article 1.3. (b) protective systems are placed on the market separately for use as autonomous systems20. Consequently their conformity with the relevant EHSRs of Annex II has to be assessed according to Article 8(2) and they have to be marked according to Article 10(2). Of course ‘protective systems’ may also be placed on the market as an integral part of equipment. Technically speaking these remain ‘protective systems’ because of their function, but are not considered as autonomous protective systems in the sense of the Directive regarding conformity assessment and marking. In such cases their conformity is assessed in the course of the conformity assessment of the equipment they are integrated into, using the procedures foreseen in Article 8 according to the group and category of that equipment. They are not separately marked. It is, however, important to note that the specific EHSRs of Annex II.3 also apply for integrated "protective systems". with no autonomous function (see 3.8) (otherwise they would have to be regarded either as equipment, protective system or as device according to Article 1(2)). A product is considered to have an autonomous function if it can be safely used to deliver, or contribute towards the delivery of, one or more of the intended functions of Article 1.2 or Article 1.3.a) or b), without the need to add any further parts. This does not preclude that specific instructions for installation and use are to be followed. 19 Article 1.3(b) of the Directive. 20 See Corrigendum to the English language version of Directive 94/9/EC (OJ L 21, 26.1.2000). 21 Article 1.3(c) of the Directive. Some kind of products may, depending on the extent of the conformity assessment already undertaken before being placed on the market and/or put into service, be considered either as with or without autonomous function. If the function of the product can be delivered without further parts then, where relevant, it cannot be considered a component. Components intended for incorporation into equipment or protective systems which are accompanied by an attestation of conformity including a statement of their characteristics and how they must be incorporated into products (see Article 8(3)), are considered to conform to the applicable provisions of Directive 94/9/EC. Ex-components as defined in the European standards harmonised under Directive 94/9/EC are components in the sense of the ATEX as well. Components must not have the CE marking affixed unless otherwise required by other directives (e.g. the EMC Directive 2004/108/EC). According to Article 8.3 the conformity of components has to be assessed by means of the same procedures as the equipment, protective systems or devices according to Article 1(2) into which they are to be integrated. Some components may be assigned a category, in which case they will always be used in equipment of that category. Other components may be more widely used, and no category can be defined. In addition, components for e.g. autonomous protective systems do not need to bear a category as the protective systems themselves are not categorised. It depends on the detail that is given in any documentation provided (e.g. where relevant by means of a written attestation of conformity). For example, drive-belts, bearings, mechanical seals, Zener diodes, etc. are not usually placed on the market with the explicit intention to be incorporated into equipment, protective systems or devices according to Article 1.2 but for general engineering purposes. Their conformity (i.e. their suitability for the intended purpose as regards safety of the product they are integrated into) has to be assessed in the course of the conformity assessment of the integral product. If components are to be placed on the market with the explicit intention of incorporation into equipment, protective systems or devices according to Article 1.2 (as e.g. increased safety terminal blocks, flameproof enclosures, etc. ), they shall be assessed separately according to Article 8.3 and accompanied by a written attestation of conformity as referred to in Article 8.3. Otherwise, Member States can prohibit, restrict or impede their placing on the market (Article 4.2) and cannot presume their conformity (Article 5.1). If a component is subject to a conformity assessment procedure under which a Notified Body issues a Type Examination Certificate, the Certificate must detail those requirements of Annex II that have been assessed. These devices are covered even if they are intended for use outside the potentially explosive atmosphere. Those devices are not classified into categories according to Article 1. Safety instrumented systems (e.g. a sensor, PLC and an actor) in the sense of items 1. and 2.. The whole system must be considered as a safety device in the sense of Article 1.2. Parts of this safety device may be located inside (e.g. a sensor) or outside (e.g. PLC) potentially explosive atmospheres. For such devices, the essential requirements shall only apply so far as they are necessary for the safe and reliable function and operation of those devices with respect to the hazards of ignition or - respectively - with respect to the hazard of uncontrolled explosion (Annex II, Preliminary observation B). controller units connected to sensors measuring temperature, pressure, flow, etc, located in a safe area, used to control (in terms of further avoiding an ignition hazard) electrical apparatus, used in production or servicing operations in a potentially explosive area. For safety and economic reasons it will be preferable in most cases to install such devices in a non­hazardous area. However, sometimes this might not be possible. In such cases, although the Directive does not explicitly say so, these devices can also be designated as equipment. If the device does not have its own potential source of ignition then the device shall not be regarded as equipment but, evidently, the requirements resulting from Article 1.2 will still apply. Devices other than safety, controlling and regulating devices. Monitoring devices providing only an alarm signal to protect persons but without control of the equipment inside the hazardous area. Emergency ventilation systems which act when gas is detected.